The two STEREO probes leave Earth bound to take positions fore and aft of the planet in order to observe the Sun. Two NASAprobes are running a gauntlet of tests and checks in preparation for theirmission to watch some of the Sun's largest explosions in three dimensions. Engineersare ensuring the space worthiness of NASA's twin STEREO spacecraft for theirupcoming hunt of coronal mass ejections (CMEs), enormous solar eruptions ofhigh-energy particles that can interfere with satellites and pose a danger toorbiting astronauts when directed at Earth. Oncelaunched, the two STEREO probes will take up Sun-watching positions ahead andbehind Earth to record the first real-time "3D" images of our nearest star. "From thespace weather standpoint, this will be very important," said Michael Kaiser, STEREOproject scientist at NASA's Goddard Space Flight Center (GSFC) - where theprobes are currently being tested - in a telephone interview. "The events onthe Sun that you're very interested in are the one's coming right at you. We'llbe viewing them from the side." Keepingtabs on CMEs and the radiation spewed from the Sun will become even moreimportant in the future, when astronauts leave the relative protection of theEarth's magnetic field on long-duration spaceflights, Kaiser added. Bylaunching two spacecraft instead of one, researchers hope the STEREO missionwill shed new light on how massive CMEs form and propagate throughout the SolarSystem. Previous 3D observations of the Sun taken by the Solar and Heliospheric Observatory (SOHO)used images caught one at a time, during which time conditions may havechanged, Kaiser said. Both STEREOspacecraft are currently set to launch spaceward atop a Boeing-built Delta 2rocket in Spring 2006 in a flight to be staged from Florida's Cape CanaveralAir Force Station. NASA'sSTEREO probes - short for Solar TErrestrial RElations Observatory - carry fourinstrument suites to study CMEs as they blast outward from the Sun out past theEarth's orbit. "In termsof technology, STEREO is sort of an odd mission," said Andrew Driesman,spacecraft systems engineer with Johns Hopkins University's Applied PhysicsLaboratory (APL), which built the probes. "We tried to get two spacecraft forthe price of one." The STEREOmission has an estimated NASA cost of about $460 million, as well as $60million in support from European partners, NASA officials said. Each of theSun-watching probes carries a set of coronagraphs and imagers similar to thoseaboard SOHO, which has spent nearly 10 years observing our parent star. Both STEREOwill relay real-time observations of the Sun to Earth, where researchers expectto combine the to build three-dimensional views of the star, as well as its CMEand solar wind activity. A trio of antennas on each spacecraft will also recordthe radio signal bursts from the energetic solar events. "They'reset up to take observations within half a second of each other," Kaiser said ofthe STEREO probes. "This is kind of a poor man's formation flying." But theprobes are not completely identical, and carry subtle differences due to theirdifferent orbital destinations. Each probe's launch position and finaldestination gave the spacecraft their tentative names, mission team memberssaid. "Right nowthey're [STEREO] A and B for 'Ahead' and 'Behind,'" Driesman told SPACE.com,adding that the A probe will also sit atop the Delta 2 launch stack, while theB spacecraft will be positioned below it. STEREO A isslated to fly just inside Earth's orbit but ahead of the planet, completing onefull orbit in about 347 days. Because it will fly closer to the Sun, the starwill appear larger to the probe's coronagraphs and required larger occultingdisks used to blot out the Sun's body during corona observations. "They endup on orbits slowly moving in opposite directions," Driesman said. Accordingto their flight profile, each spacecraft will move further from Earth duringthe STEREO mission's two-year mission, though the gradual separation should nothinder its science goals. "Eventually,you run into a point where they're both on opposite sides of the Sun," Kaisersaid, adding that it should occur well after the primary mission. "The missioncould probably go on for five or six years [depending on funding]." 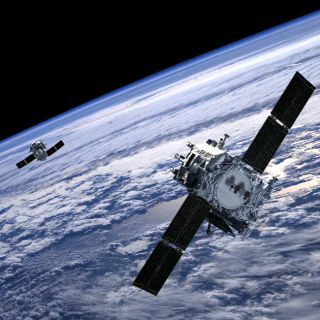 Despitetheir joint mission, the two STEREO probes won't be the sole observers of theSun during their spaceflight. Spacecraftsuch as the successful SOHO, and other missions such as Windand AdvancedComposition Explorer (ACE), have provided bonus observations from relativelyclose to Earth when compared with the planned STEREO flight. Data andobservations from those spacecraft can be added to STEREO's findings to build amore comprehensive picture of the Sun's behavior, researchers said. "It's niceto have that one [location] right in the middle," Kaiser said. "That thirdvantage point from SOHO, that helps." Kaiseradded that the STEREO mission is a reunion of sorts for Sun-focusedresearchers, many of whom are either working together or collaborated in thepast on the other Sun-watching missions. It should takethe two STEREO probes about three months to take up their respective sun-watchingpositions. Bothspacecraft will swing past the Moon, using its gravity to fling them towardtheir final orbits, though STEREO A will have to fly past the grey satellitetwice in order to accelerate past Earth to its intended station, NASA officialssaid. "We're sortof hooked to the lunar cycle," Dreisman said, adding that while the STEREOmission plans to launch sometimes between April and June 2006, there isactually more flexibility to make the space shot. "We have a launch window[almost] every month of the year." While mostmonths have a period of about 14 days - each with a 15-minute launch window -to loft the two STEREO probes, a December liftoff would require an extendedcoast phase that could prove too long for the probes' batteries, he said. But beforeSTEREO A and B can leave Earth, engineers must be sure they're fit to fly. Overthe next few months, the probes will be locked away in vacuum chambers,subjected to the intense vibrations and noise they will experience at launchand witness the extreme temperatures they must endure in order to successfully performtheir mission. "It's beensuch a long road here, we've been looking forward to this," Kaiser said of thetesting phase. "I think [the mission] is going to open up a whole new world forus."